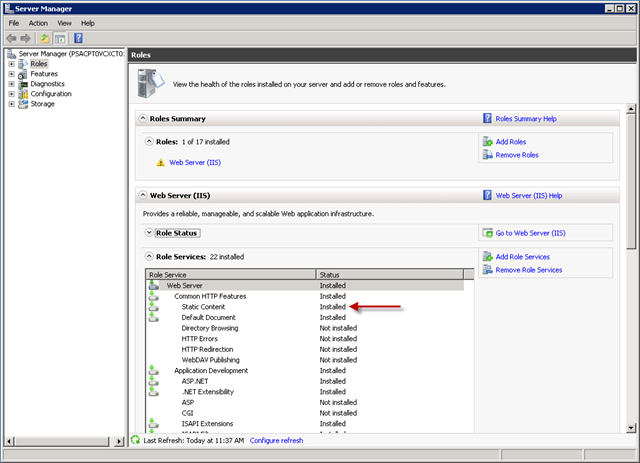 Installing Exchange 2007 on Windows 2008 or 2008R2 is slightly different than installing on Server 2003. This includes installing Exchange 2007 SP3 on Windows 2008R2 since the pre-requisites that were taken for granted now need to be installed explicitly, especially concerning IIS. I had an annoying issue on OWA, where instead of seeing the OWA pictures I would have expected, I saw red X’s. After perusing various avenues, including authentication, IIS config, etc, it boiled down to a simple missing prerequisite – the ability for IIS on Server 2008 to serve static content. In order to keep the post short, I’m posting the command lines versions only. OWA started working 🙂 Happy troubleshooting.